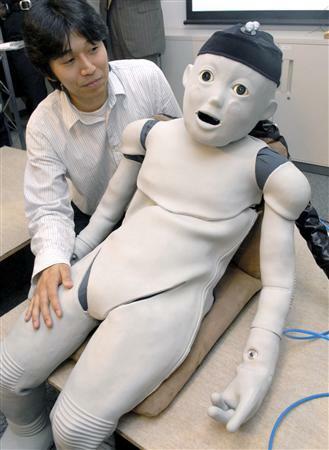 On June 1, researchers from Osaka University's Graduate School of Engineering unveiled a robot that acts like a human infant, which they hope may one day help scientists better understand the child development process. The researchers have named the baby robot "CB2," and for now, it is designed to function as a 1- to 2-year-old child, gazing intently at its surroundings, squirming about on the floor and lighting up the room with child-like charm. The 130 cm long, 33 kg robot features 56 air cylinders that serve as muscles. With cameras for eyes and microphones for ears, and with 197 tactile sensors embedded in the layer of soft silicone skin covering its entire body, CB2 is well-equipped to take in environmental stimuli. When CB2's shoulders are tapped, it blinks as if surprised, stops moving, and turns its gaze toward the person who touched it, and when a toy is dangled in front of its eyes, it appears to devote all its energy to trying to reach for it. CB2 also has a set of artificial vocal chords that it uses to speak baby talk. The researchers say that once CB2 is equipped with software that gives it the ability to learn, they will be very interested in undertaking the long-term challenge of teaching it how to walk and talk. 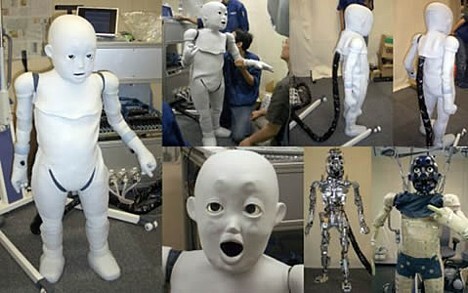 UPDATE: Check out videos of little CB2 -- whose full name is "Child-robot with Biomimetic Body." Fans of Actroid and Geminoid might recognize one of the faces in the videos -- that of robot designer Dr. Ishiguro. Video 1: Toward the end of this report, the announcer says that within the next four years, researchers at the Japan Science and Technology Agency (JST) -- who worked with Osaka University to develop CB2 -- hope to create a slightly more advanced version of the robot that has the vocabulary and cognitive skills of a 3-year-old child. At the end of the report, the Osaka University project leader says this type of "soft" robot technology will facilitate communication between humans and robots, which will prove useful for research purposes and for developing robots that can better assist and entertain us in our day-to-day lives. Video 2: This report also mentions that the research team hopes to eventually create a robot that children can play with. Researchers at Kyoto University have developed new semiconductor laser technology that allows the shape of beams to be tailored freely and that can output beams up to 10 times more compact than existing beams � a development that could lead to a tenfold increase in the storage capacity of optical discs. Research results were published in the June 22 edition of British science journal Nature. The Kyoto University group, led by professor Susumu Noda, worked with Kyoto-based Rohm Co., Ltd. and the Japan Science and Technology Agency (JST) to engineer layers of photonic crystals consisting of tens of thousands of small holes, which were incorporated into 0.5 mm x 0.5 mm semiconductor chips. The photonic crystal layer works as an optical resonator, with each individual hole functioning as a tiny mirror that causes the light to resonate in the semiconductor until it is emitted as laser light. The result is a laser beam with a diameter up to 10 times smaller and with properties different from those of conventional semiconductor lasers. According to the researchers, these new semiconductor lasers were able to produce a range of beam patterns while maintaining stable single-mode oscillation. 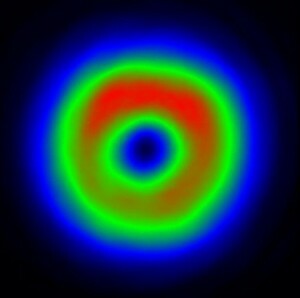 The ability to control the oscillation direction of light in this way could lead to the development of compact lasers capable of producing diverse beam patterns on demand, such as hollow beams (with cross-sections that look like donuts), concentric hollow beams (donuts within donuts), and other shapes that have heretofore been impossible to form. Controlling the oscillation direction of light also means that lasers can be focused into ultra-thin beams, enabling a tenfold increase in the density of data storage on discs without changing the wavelength of the laser. Using blue lasers such as those used in Blu-ray disc technology could lead to DVDs with hundreds of gigabytes of capacity. Potential applications are not limited to ultra-high density storage media. Ultra-thin, hollow beams could be used as "tweezers" for trapping and moving microscopic particles, which could bring a new level of precision to molecular-level processing and fabrication. Hidemi Takasu, Rohm's research director, says, "In addition to seeing our research applied to next-generation DVD technology, we hope it can be applied to imaging technology that uses lasers to project precise images directly onto the human retina."